The Risebrough residence, located in North York, ON is an innovative environmentally responsible, and energy-efficient home that incorporates a forward-thinking wall assembly designed to improve the durability and performance of a home, while improving occupant health and comfort. The home, known as the Risebrough Residence, required innovative design and high performance building materials to achieve its air-tight, high-efficiency goals, along with careful collaboration between the architect and builder. For this project, SUSTAINABLE.TO Architecture + Building and Greenbilt Homes decided to adapt their Toronto Method Wall Assembly, a wall system conceived and tested to address the issues typically experienced with a code minimum wall in Southern Ontario’s extreme climate (where temperatures can reach +35˚C in the summer and -35˚C in the winter). The team wanted to address the issue of condensation control, thermal bridging, air tightness and energy efficiency, all while using conventional, yet more sustainable and environmentally-conscious building materials. The trouble with a code minimum wall is that it only considers that vapor drive is from the inside out. That’s fine in winter, because that’s what happening. However, when we cool our homes in the summer, the vapor drive is the other way around, so the polyethylene sheeting (vapor barrier) is in exactly the wrong place, allowing it to trap moisture as vapor cools and condenses on the poly sheet. To avoid the issues with a code minimum wall, SUSTAINABLE.TO and Greenbilt developed the Toronto Method Wall Assembly. It recognizes that you can achieve a better building envelope by placing the right amount of materials, in the right place. It also embraces the easiest and lowest cost passive house measure, which is to first reduce the overall energy demand of the home. 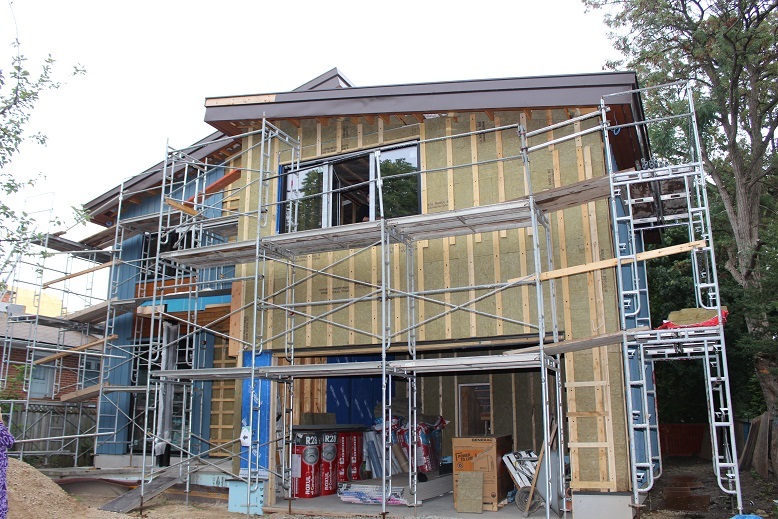 The team started with two-by-six framing which was then filled with 3.5 inches of ROXUL Comfortbatt insulation. Stone wool or rockwool insulation was used both inside and outside the home because of its high recycled and natural content, high r-value, vapor permeability, moisture repellency, fire resistance, as well as its ability to be sourced locally. Made of inert materials, stone wool also resists the growth of mold and mildew. Framing with 2 X 6 studs allowed all services such as plumbing and electrical to be installed inboard of the insulation, resulting in a better fit and reducing heat loss though thermal bridging. Outboard of the sheathing, the Toronto Method calls for a single, continuous, semi-permeable membrane for air, vapor and weather control to prevent uncontrolled air leakage. In this case, Henry Blueskin VP100 was used. Following that, a thick blank of continuous ROXUL Comfortboard 80 rigid board insulation was installed around the home’s exterior, preventing thermal bridging almost completely. Two, three-inch layers of Comfortboard 80 were used for a total thickness of six inches. With a balance of two-thirds of the insulation on the outside of the home, and 1/3 on the inside, placement of a vapor retarder becomes unnecessary. Instead, the plywood sheathing acts as a vapor retarder, slowing transmission of vapor and allowing the wall system to dry to the inside and the outside per seasonal vapor drive in Toronto’s extreme climate. With a tight, but breathable, building envelope, the home’s energy demands are significantly reduced. The wall system is finished with wood strapping and lightweight cladding. • Uses sustainable, common & easily-sourced building materials in a more effective way to achieve a better performing building envelope. To ensure goals are met, SUSTAINABLE.TO performs periodic site reviews to ensure construction is proceeding as intended. A Blower-Door test was performed to review the building envelope for air leakage to ensure a continuous air barrier. From a pre-inspection reading of 4.30 ACH50 (Air Change per Hour at 50 Pascals), SUSTAINABLE.TO was able to pinpoint air leakage, and improve air-tightness to a final reading of 1.7 ACH50—which translates to a 35% reduction in energy use from air-tightness alone. Overall, the Risebrough Residence was able to achieve 80 per cent greater efficiency than a conventionally built home. The Toronto Method Wall Assembly was one strategy used to realize greater efficiency. A range of other passive house and energy efficiency measures were incorporated. 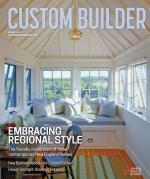 Comments on: "Raising the Bar: Achieving Greater Sustainability and Energy Efficiency in Residential Construction"